The Women’s Foundation of Collier County (WFCC), a fund at the Community Foundation of Collier County, has announced the 2017 Women of Initiative. 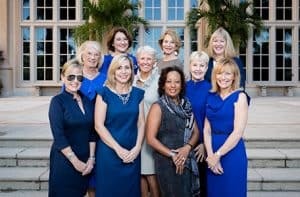 Each spring, the Women’s Foundation of Collier County honors ten local women leaders who, through their leadership styles, are an inspiration to all women seeking to make a difference through philanthropy and civic engagement. 185 women have been honored since 1998. The 2017 honorees are: Penny Allyn, Dusti Beaubien, Susan Reed Benson, Mary Beth Crawford, Kathy Feinstein, Kimberly Leach Johnson, Susie McCurry, Kathleen Peck, Diana Riley, and Kathryn Woods. The 2017 Women of Initiative will be recognized for their achievements during the annual Women of Initiative Luncheon to be held on March 31, 2017 at The Ritz-Carlton, Naples Beach Resort. Videos featuring each honoree will be shown at the event. For more information about the Women of Initiative Honorees Luncheon, please visit wfcollier.org or call Carri Kriesman at 239-649-5000.